Dr Ying Zhao’s MMed study is entitled “Improved treatment outcomes with bedaquiline when substituted for second-line injectable agents in multidrug resistant tuberculosis”. Her MMed is supervised by Dr Sean Wasserman and Professor Graeme Meintjes. In her study she evaluated outcomes at 12 months of patients with MDR-TB who switched from an injectable to the new TB drug, bedaquiline, because of intolerance. 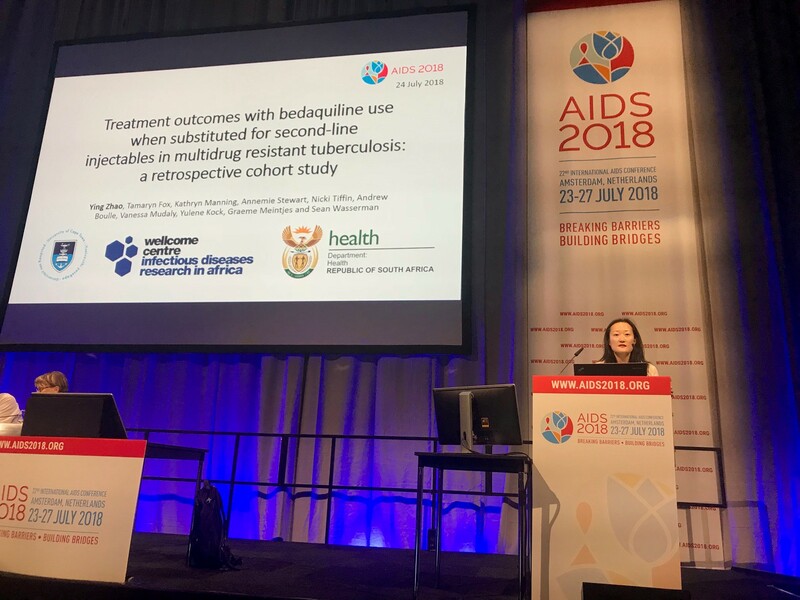 Dr Zhao presented her findings at the AIDS 2018 Conference, the largest international conference on HIV, which took place in Amsterdam in July. Injectable agents are poorly tolerated and result in substantial toxicity for patients with MDR-TB. Bedaquiline is commonly used in practice as a substitute when injectables are discontinued due to intolerance, but the efficacy and safety of this strategy, particularly amongst patients with HIV, had not been studied. Dr Zhao addressed this question with a retrospective cohort study, in which she identified 162 adults with MDR-TB who received bedaquiline as a substitute for injectables in the Western Cape, and compared their 12-month treatment outcomes to a group of 168 controls who did not interrupt injectables, matched for clinic location and time of treatment initiation. The proportion of patients reaching the primary endpoint of unfavourable outcomes at 12 months (defined as death, loss to follow up, or failure to achieve sustained culture conversion) was significantly lower in the bedaquiline group (relative risk, 0.66; 95% confidence interval, 0.46 to 0.95), as were the number of patients who reverted to a positive sputum culture after initial conversion (1 in the bedaquiline group versus 12 amongst controls). There was no difference in the number of deaths at 12 and 18 months after treatment initiation, providing additional evidence that bedaquiline is safe and effective in programmatic settings with a high burden of HIV co-infection. A manuscript reporting the study findings has been submitted for publication. We congratulate Dr Zhao on conducting a high-quality study for her MMed and this international recognition of the importance of her study.